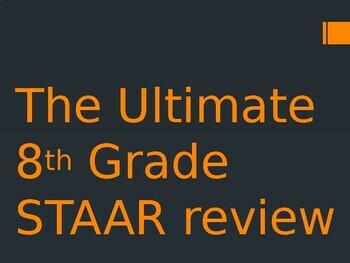 This is a huge compilation of over 100 review questions that are in review for the 8th grade STAAR Reading test.This covers everything from Theme, main idea, poetry, inferences, drama, setting, characters, point of view, mythology, plot, text structure, and so, so, much more! This PowerPoint Presentation can be used multiple ways! It can be used as a game, a review, or flashcards! 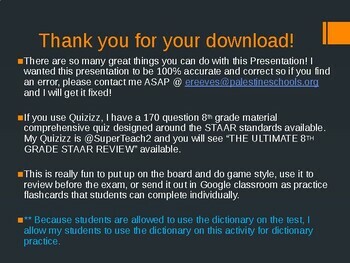 I have taken many of these questions from my Quizizz "The ULTIMATE 8TH GRADE STAAR REVIEW" that has over 170 questions! It makes reviewing fun, it you can turn it into a game or test! 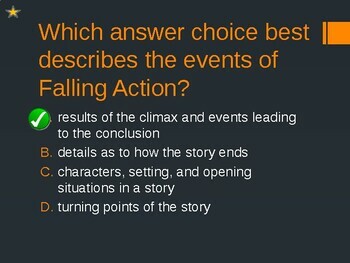 The presentation is set up to so that the question appears first and then a check mark appears on the next click that reveals the answer so all the questions have answers selected. If there are typos, errors, etc. in this presentation, please email me at ereeves@palestineschools.org so I can get it corrected!